Appointments are colour coded on the calendar by consultant and location for easy identification. Your appointments can be viewed on the calendar by day, week or month. These views allow you see your bookings from a different aspect so you can plan workloads and avoid consultant or location clashes. Book appointments for anyone, anywhere, efficiently and simply across your rooms, clinics and offices. You can use your PC, laptop, tablet, iPad, Android phone or iPhone to easily check your schedule and make new bookings. Booking an appointment for someone new is easy, enter their name on the appointment page – you can fill in the details later. For existing clients, just type in a few letters of their name, phone number or address and select from the list provided. Include a bookings page in your current website or add a Bookings button onto your Facebook page. Customers can go onto your web or Facebook page; say what treatments(s) they want, where and by whom then select from the dates and times that are available. They provide some personal details and make their booking – you can charge a booking deposit if you want. 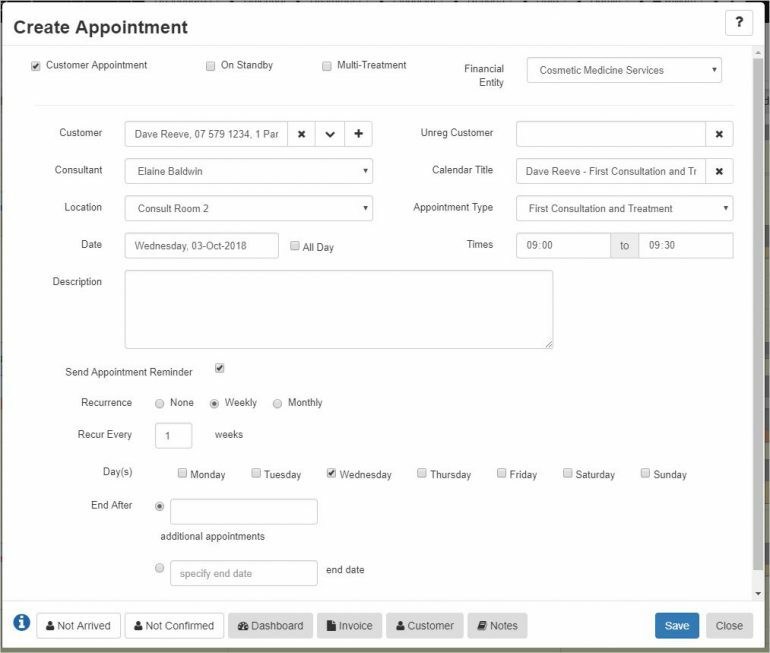 Their appointment(s) will show on your calendar and you & the customer receive confirmation messages. Easy to set up & manage and included as part of the Cloud Appointments package for no extra charge.